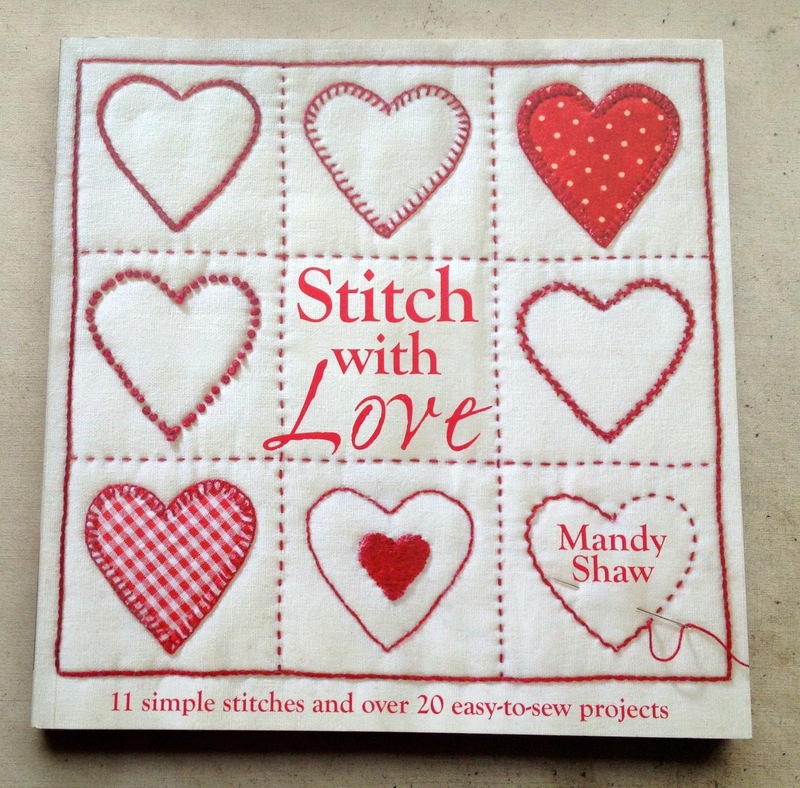 As I said in my last blog I took a workshop with Mandy Shaw. My! what a fun lady. The only way to describe the workshop was fast and furious, but above all fun. We laughed all day long and made an incredible amount of different things. This was what greeted us on the classroom wall on arrival, so many lovely Christmas decorations. I would have needed one of those cameras that piece photos together to get it all in. The little angel on the left was just adorable,and though my youngest grand daughter is getting a bit big for dolls I had to buy the pattern. I reckon I will just have to make her for me, she was so cute with her big feet and raggedy dress. 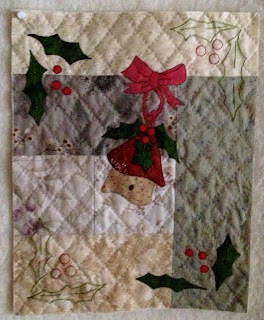 Now I am home I am going to make a garland of snowmen and hearts to hang up for Christmas, and some more of the lovely little stockings. 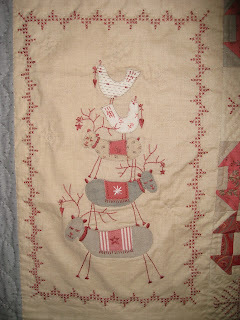 Or I might just make lots of reindeers or robins, who can tell. I will let you know in a later blog. My, that was such a fun day. Things I made in the class. Looking over my blog posts for the past couple of weeks I seem to be flitting about somewhat, so I thought I had better tidy up a bit. The lovely silver thread that I had to send to the USA worked out at £7.59 a skein after customs and the post office had added their bits on. So is now very precious. I have whip stitched over my elves beards to make them more visible and yes they are now looking good. Does my beard look good in this. 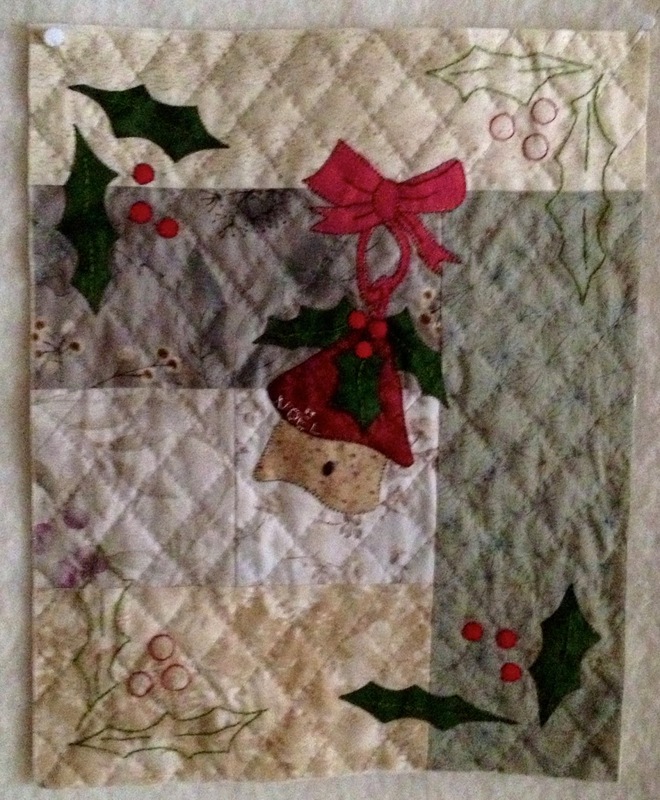 The top is now finished and now the dilemma is how do I quilt it. I hung it on the wall at Wednesday Club and the girls all made lots of suggestions. Its now hanging on my design wall and I have been looking at it every day but nothing has come to me as yet. It's just not talking to me. Sorry about the bad photo. Talking of Wednesday Club, several weeks ago I said the lovely Ann was making tree skirts. Well they were not tree skirts at all, they were table centres and they are lovely. On friday Alison, Jenny and myself did a days workshop with Mandy Shaw at Quilters Haven. "Stitch with love. "making the most lovely Christmas decorations. These will have to wait till my next blog post as I now have to go make sunday lunch. I did do the stitchery on the bird house and the leaves. 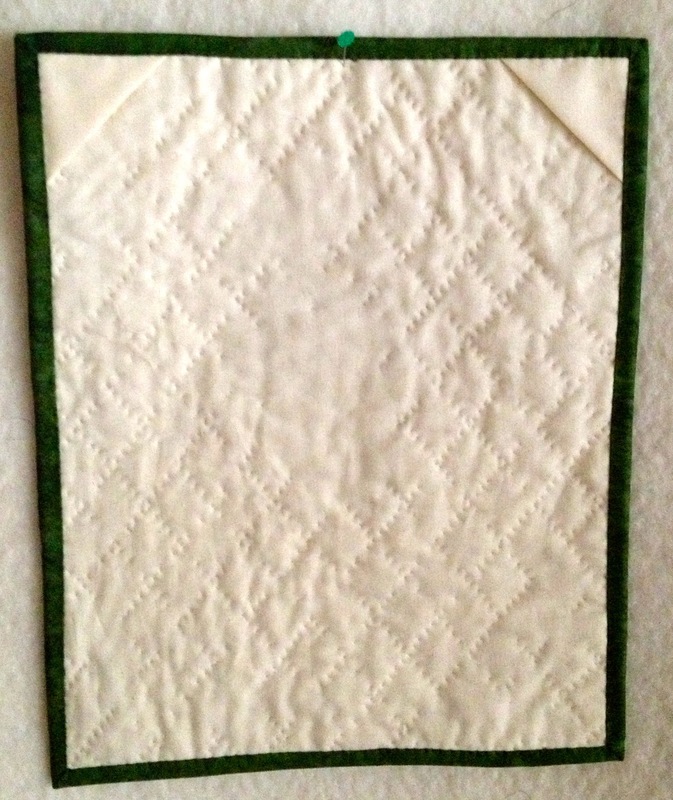 Then marked the quilting lines, basted the little quilt with wadding and backing. It's a dreadful day,all overcast and grey so I am going to sit by the fire and quilt my little quilt, not feeling guilty at all, the garden can wait for another day. I attached little corners for the hanging rod to fit in. 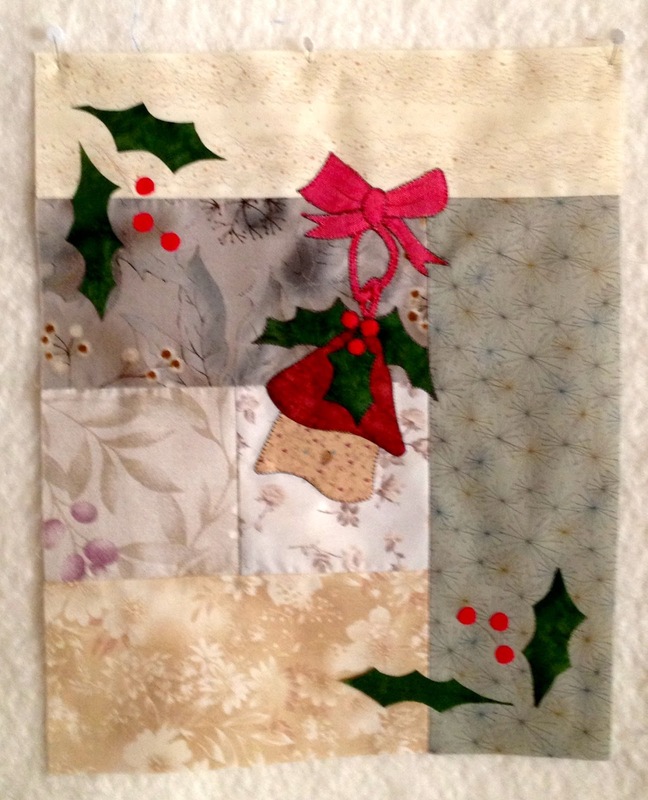 Now just the binding to do. from a little drawing to a finished quilt, it's been lots of fun. This all started with a little drawing and me wondering what to do with it. So I made a very small quilt, more like a block really 12" x 15"
with some fairly neutral scraps that I had. Now what do I do. 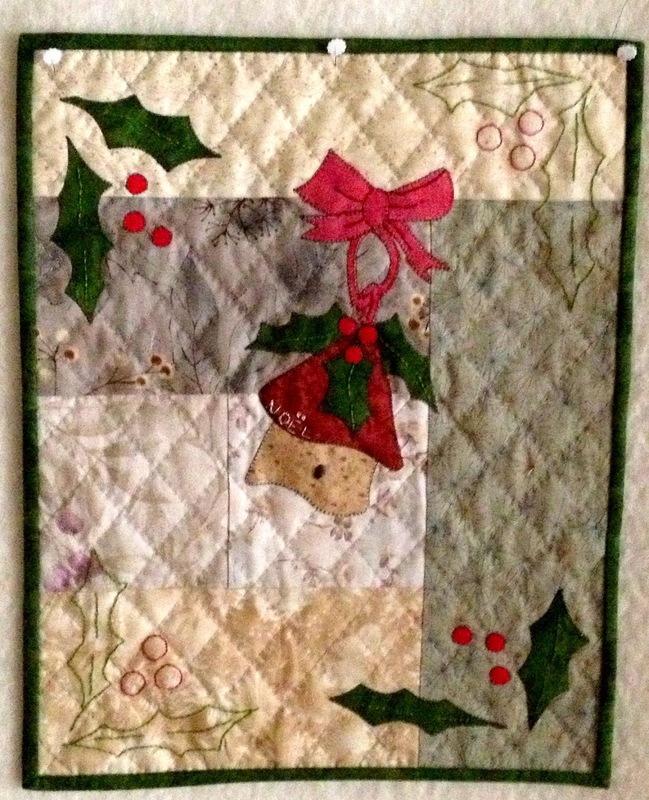 I decided on appliqué, so after rummaging around in the scrap boxes, this is what I came up with. Not there yet I thought. Now what does it need? 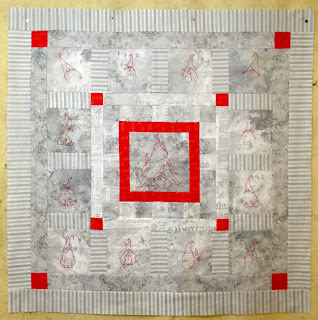 Well the little quilt has been on the design wall all night, so I looked at it with fresh eyes this morning. Definitely not there yet. There is some stitchery to do on the bird house and the leaves. I will do that first and then see what it looks like. As usual I have gone off at a tangent. Did I do the stitchery on the little bird house? No...... I filled in some of the negative spaces with stitchery, as you do, so I still have the stitchery on the bird house and the appliqué leaves to do, but at last I think it is getting there Ha! 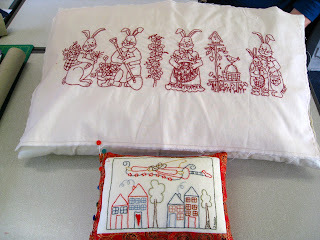 To be continued when I have done said stitchery. Well it was Wednesday Club and there were not a lot of us there.We should rename it stitchery club as only three people had brought their sewing machines, the rest of us were doing things to do with stitchery. 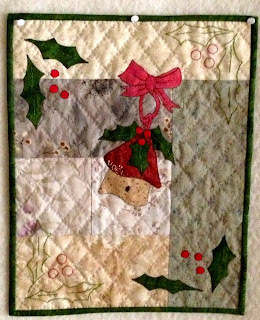 I have finally put a sleeve on my Lynette Anderson Christmas quilt of two years ago, and will now give it to my two youngest grandchildren for Christmas. 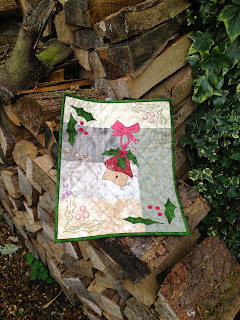 This little panel always makes me smile, its just so funny and I might just make this one again for myself to hang up at Christmas.I have so many things to do on my to do list, that it might not be this Christmas ha! I spent the rest of the day hand quilting another Elfin Patch quilt that I am designing, possibly for Karin, it's still secret so I can't show you yet. 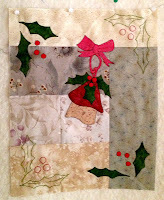 I have used lots of their patterns and their site has lots of free downloads too. Well worth a visit. I had a bit if a shock today, I ordered some Cosmos silver thread from Crab.apple Hill, as I could not get it here in the UK, they were $6 a skein, and I ordered six, the postage was $17 and then would you believe it, I got hit by customs and then the British Post office handling fee £12.49p. These six skeins have cost me a fortune, I do hope they look GOOD on the Christmas quilt I am doing. It's for the elves beards. Will share picture with you when it is finished. 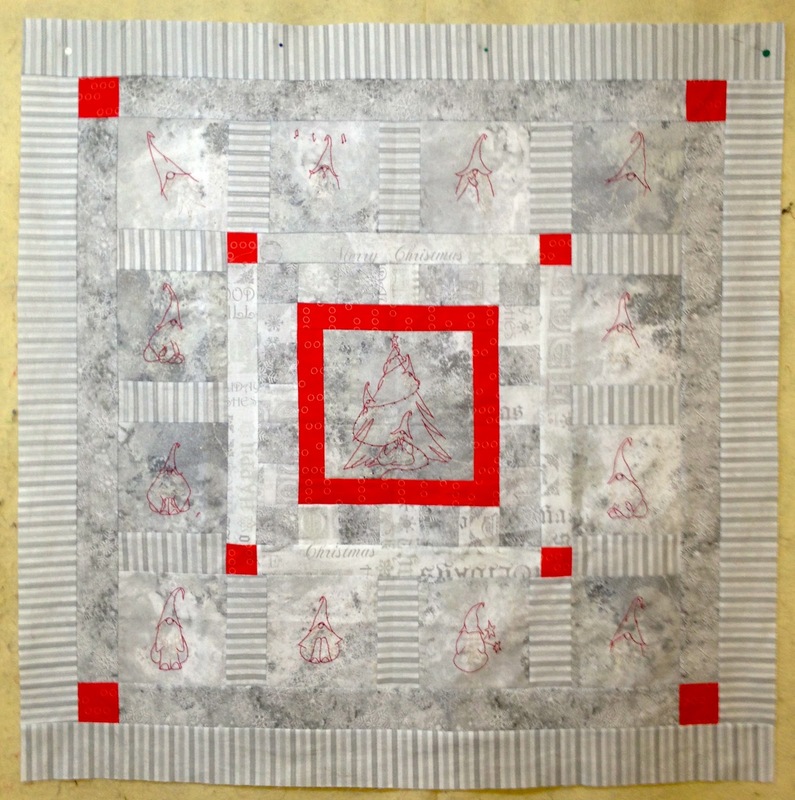 Quilting at the Bee is a joy, we go there when we are not at Wednesday Club, which is as you know is at Quilters Haven. It is a hall belonging to the Church at Wickham Market, and not any old church hall I might say, it is bright, light and above all warm. 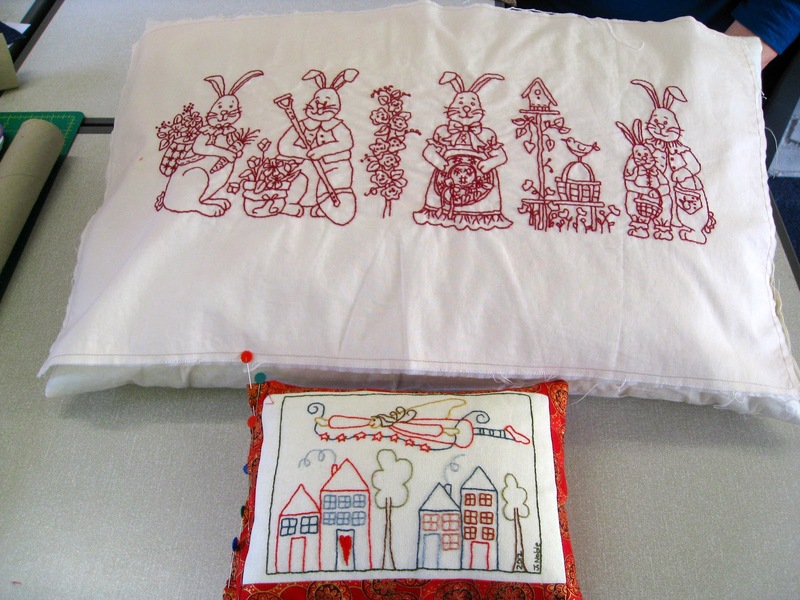 We all sit around a large table, and do hand sewing, a bit like the old fashioned Quilting bees. It is continuous laughter from 10.30 till 3.30, but we do get some sewing done. 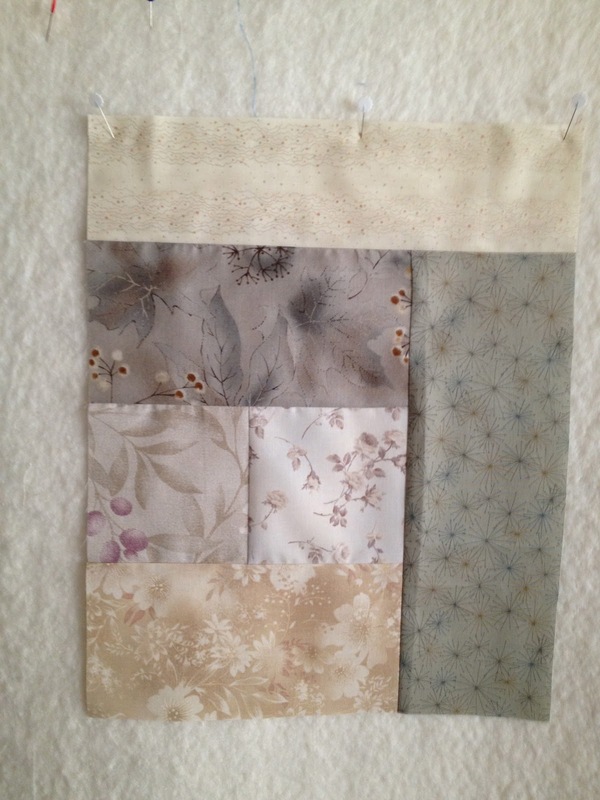 Three of us were working on our Lynette Anderson button club BOM. and you will be pleased to know I have been very busy and caught up, there is just one month to go. Fiona was working on a lovely embroidery of cow parsley or the much nicer name Queen Ann's lace, sorry no photo. She also brought to show and tell the lovely quilt she had just finished for her nephew. 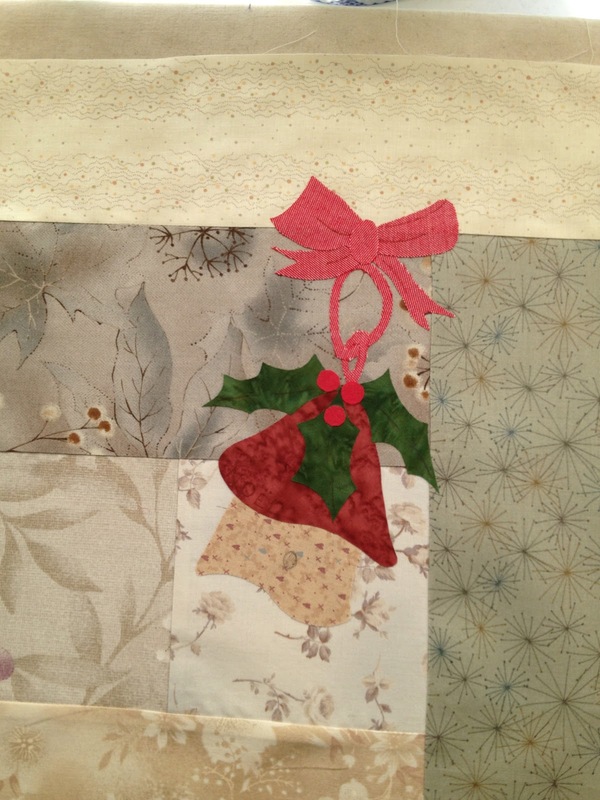 Annie was working on some tiny English paper piecing to match her lovely bed quilt.,Ann on her Xmas tree skirts (they are looking great,) Maggie was making another Pesky Bag for her stall for the church sale and Jean was knitting. Her knitting is so neat, my knitting consists mainly of knitting socks for the family and the occasional scarf. I know this sounds like a long list of names but lets face it I can't leave any one out. We laughed so much and mostly at poor Jenny and her wonderful knitted hat, unfortunately the photos of this wonderful hat, are so poor,(my fault), you are going to have to take my word for it. This little bag has been all the way to Key West and not even been opened, it has my Fern Hill BOM all the threads, yoyo's and bias strips needed to almost finish it. but sadly it languished in all the heat while I had lots of fun. It has at last been opened, quilt spread out and I do intend to get on with it today as there is only one more month to go, and I really do want to keep up to date. Coming from the heat of Key West back to England has been a bit of a shock, and I don't feel much like moving far from the fire, plus we are still a little jet lagged. I know this sounds like an excuse. No it's not, I have tidied the sewing room, and am now ready to get started again..
P.s. I am amazed at the amount of people that view this little blog and the places they come from Latvia,Ukraine, Germany,France, Australia, USA, Canada to name but a few, I love it but I do wish people would add a comment sometimes. keep safe and keep stitching.....Doti..